With fresh produce at it’s peak now, we are happy to suggest this tasty salad for our vegan friends. It’s a lovely crunchy mixture of fruit and vegetable with a nice spicy yet sweet dressing. Clean the salad greens and place on individual salad plates. If the nectarines are organic, then slice, if they are not organic, peel them first and then slice. Peel the turnip and slice thinly. 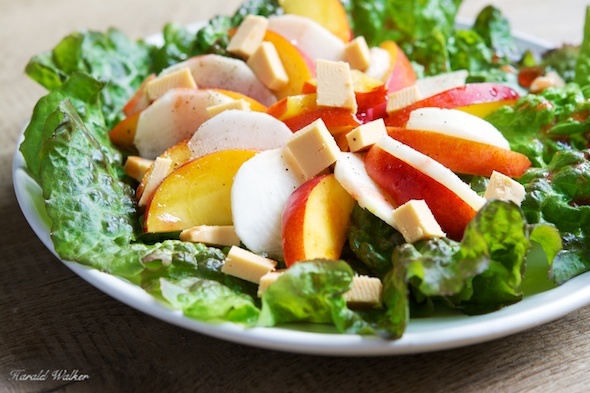 Arrange the nectarine and turnip slices alternating in a flower shape on the bed of salad greens. Slice the vegan cheese in cubes and sprinkle over the salad. Place the cleaned red currants in a small sauce pan. Add the sugar and about 1/4 cup water. Puree the red currants and push the liquid though a sieve, discarding the solids that do not go through the sieve. Mix the currant sauce with the rest of the ingredients and whisk to blend. Season to taste with any other seasonings you desire. 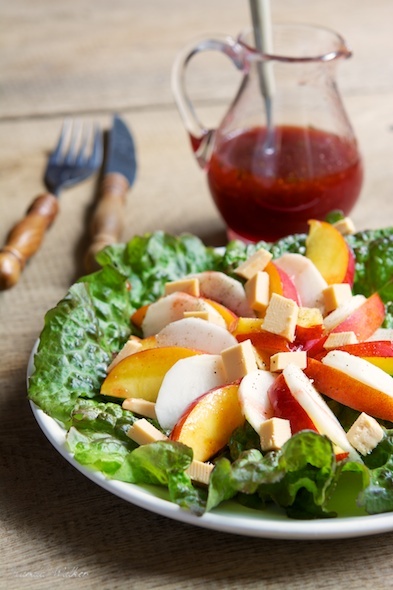 Posted by Chris Walker on July 25, 2013 in Peach, Redcurrant, Salads, Soy cheese.